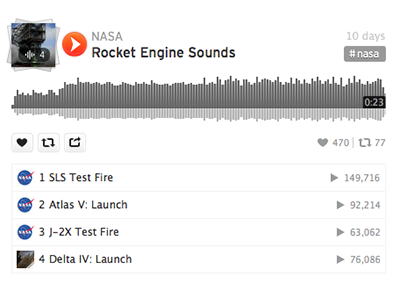 Here's a collection of NASA sounds from historic spaceflights and current missions. You can hear the roar of a space shuttle launch or Neil Armstrong's "One small step for (a) man, one giant leap for mankind" every time you get a phone call if you make our sounds your ringtone. Or, you can hear the memorable words "Houston, we've had a problem," every time you make an error on your computer.